What is the Gorilla Index? 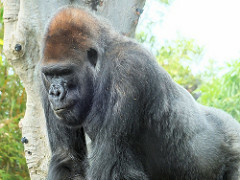 Have you heard the expression, “The 800 Pound Gorilla?” It represents a company that is so big any move it makes causes tremendous influence on its competitors. The Gorilla Index is a blended marketshare/mindshare rating from 1-10, where higher numbers make it more likely that a player is the 800 Pound Gorilla of its market. For example Google Maps is the leading Map API, dwarfing all others. Unlike the DX Index, the Gorilla Index should only be compared within its own category, since it is a scale based on competitors in a market. Other questions or want to chat about gorillas? Contact Adam.